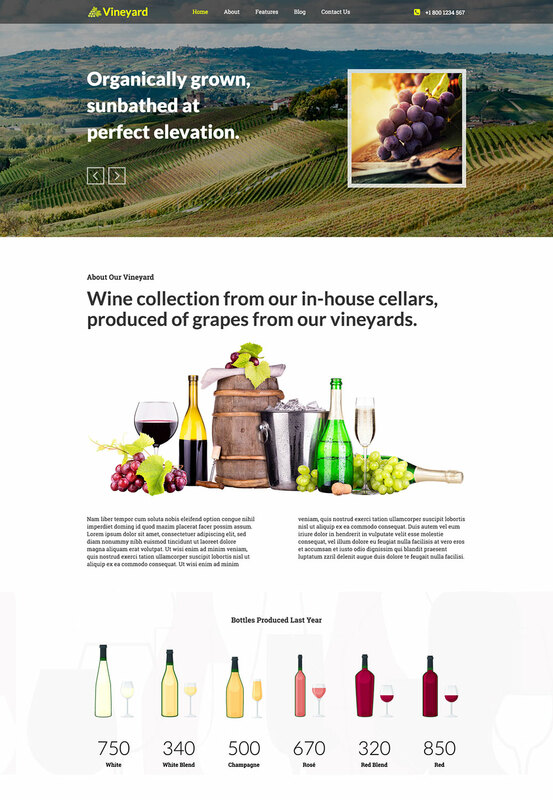 Hot Vineyard is a responsive Joomla template suitable for websites of the wine producers. It also can be a good starting point for making websites for producers of fruits and vegetables, wine sellers and restaurants. The main product of the companies that owns vineyards are grapes. It's usually used for production of the different varieties of wines. 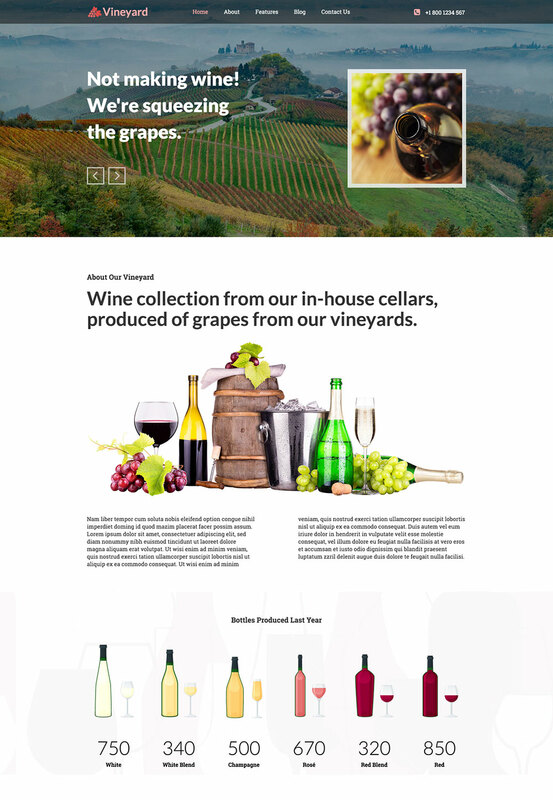 That said, during the design process of this template, we were focused on the beautiful landscapes vineyards and on the different types of grapes as the main product of the vineyards. That's what you can see on the template's main carousel, followed with some appropriate text and interesting, but not too offensive CSS3 animations. 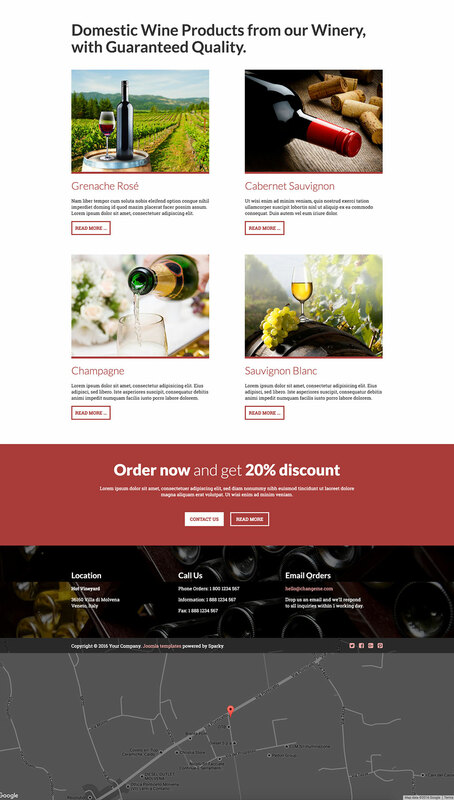 As you browse this template deeply, you will see some varieties of wines as the main product of the company that owns vineyards. The counter module represents the production status of the different kinds of wine. 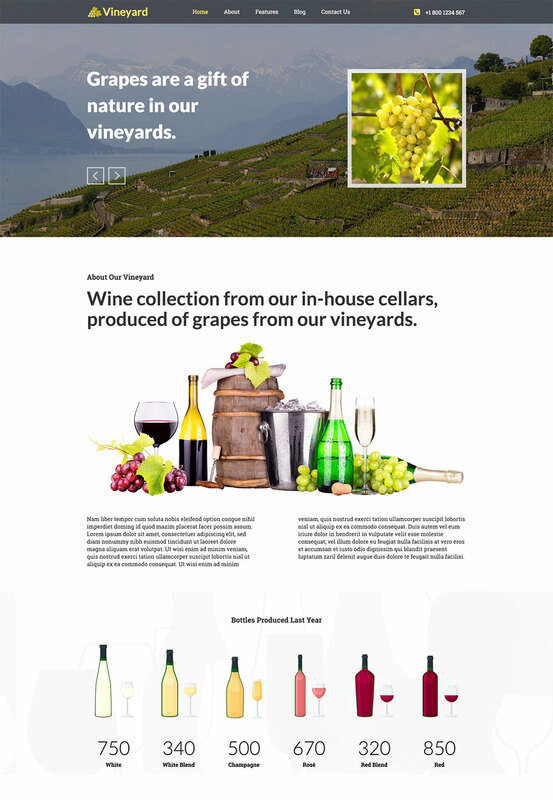 The blog of the featured Joomla articles represents wine of different types with appropriate stock photographies and 3D rollover effect powered by CSS3. The "call to action" area of this template encourages the site visitors to contact the website owners of read more about the company. 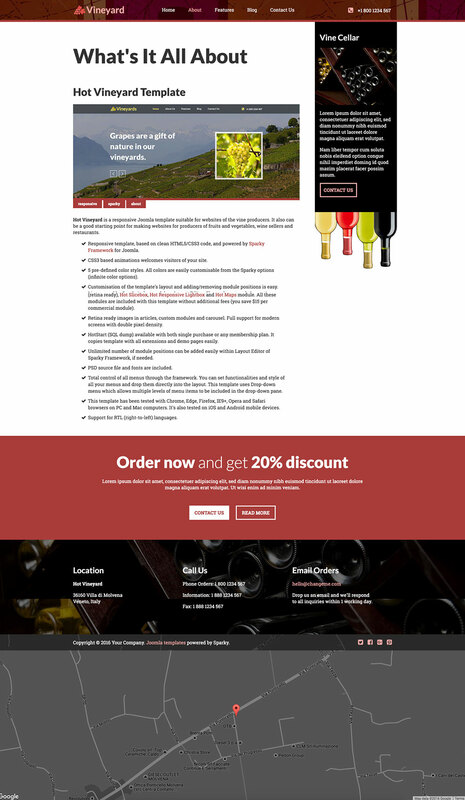 The footer area is dark with wine cellar as a background image. Finally, below the footer area, a map that shows the company location is revealed. The map has a fixed position and it's discretely revealed on visitor's scroll. CSS3 based animations welcomes visitors of your site. 3 pre-defined color styles. All colors are easily customisable from the Sparky options (infinite color options). Total control of all menus through the framework. You can set functionalities and style of all your menus and drop them directly into the layout. This template uses Drop-down menu which allows multiple levels of menu items to be included in the drop-down pane. We included several responsive Joomla modules with this template. Hot Swipe Carousel (retina ready), Hot Slicebox, Hot Responsive Lightbox and Hot Maps module. All these modules are included with this template without additional fees (you save $15 per commercial module).